Ok, so I’m going to go straight in to this and say honestly I hate my eyebrows. Well, one mainly. It’s the bane of my life and it makes me feel self-conscious and I hate it. I’ve tried loads of different things and for this year I’ve been using the ELF eye brow kit which seemed to be kinda sorting it out. It made me feel a bit better for a little while anyway. I know, it sounds so stupid but when you have that one little thing it just bugs you always find yourself drawn to it and it just never looks right. But moving on… last month I think it was, or the month before I received my Glossybox as usual and this eye brow kit came in it. I was really intrigued to find out what it was all about and if it was any good. So after over a month of using this product it’s safe to say It’s my new favourite item in my vanity. The colour payoff is amazing and they have a great consistency. They’re really easy to mix together depending what sort of look you’re wanting, I personally love the bottom left one. The wear is lasting and you need very little product to produce natural results. Even though I got this in my Glossybox, I would happily pay for it again separately. I’m really pleased with this palette and I’m feeling a lot happier about my dodgy eyebrow(s)! Victoria, I feel your pain! During the week when I'm doing my make up in the semi-darkness at 6:30 my eyebrows don't bother me, but there's nothing worse than realising in daylight on a Saturday how God awful my eyebrows are without any help...it makes me worry how I actually look on weekdays! 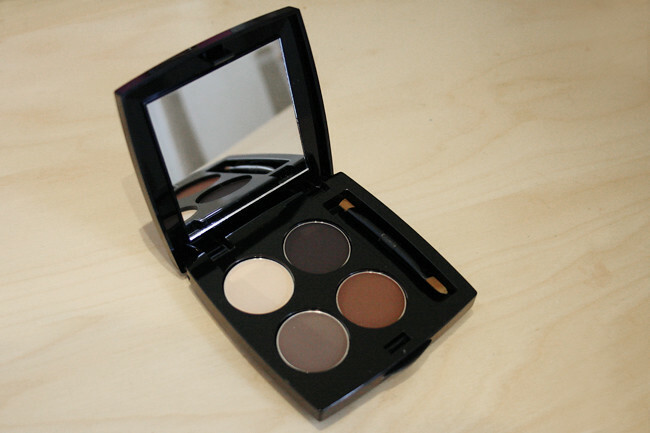 I'm using the Vivo eyebrow palette atm, but will have to give this a go when I'm done with that one! UGH I know EXACTLY what you mean! I used to have nice thick eyebrows, but when I was about 15 I plucked them into the constant 'surprised' look, which I thought looked great at the time. For the last couple of years I've been trying to grow them back (it's really hard! ), but I don't think they'll ever be the same again. I've heard so many good things about this one, I really have to try it! I love the colours in this set, they really are very natural! Oh, I don't know where I'd be without my brow palette! I use Brows A-Go-Go by Benefit and love it to bits. High-def brows really make a difference, I think. This looks amazing, might have to invest. I've just bought myself one of these pallettes and I'm in love with it.. so worth the money! If you really hate your brows I suggest you go to a salon that offer HD Brow treatment coz it is absolutely amazing, a little bit pricey but so worth it.. it literally transformed my eyebrows.. would definitely recommend it to anyone! I know what you mean about eyebrows, they're literally touch and go. Recently though I found a very neutral eyeshadow from MAC and colour my brows in with a hard angled brush. To shape them I use a Mystery by MAC and then brush it out so its not so harsh...it works great for me!